SB 172, The Philadelphia Speed camera bill, has passed the Senate! 10,000 Friends of Pennsylvania is proud to be a part of the coalition of organizations who have supported this bill. 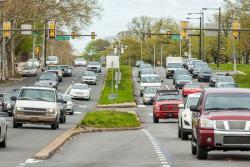 This is an important measure that will save lives on Roosevelt Boulevard—arguably the most dangerous road in America for pedestrians, bicyclists, and drivers.